Lisa Hammond salt-cellar - 2½" (63 mm) square, 1½" (38 mm) high. Lisa Hammond trained at the Medway College of Art from 1974 to 1979 and set up her first studio, the Greenwich Pottery Workshop, in 1980. She lectured for twelve years at Goldsmiths College in south east London. When the college closed their ceramics course Lisa started her second workshop in a disused railway ticket office at Maze Hill, Greenwich. She has set up weekend and evening courses to pass on her skills to the local community. 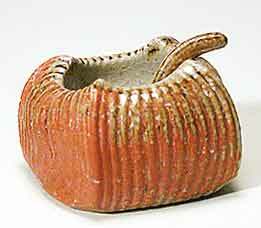 Lisa specializes in soda and salt glazes, and has pioneered the use of soda as an alternative to salt glaze. She likes to make functional wares and in common with most potters prefers her work to be used rather than put on the shelf for decoration. She has been exhibited widely in the UK and abroad. Visitors are welcome at the Maze Hill Pottery - take the Kent bound line from Charing Cross, Waterloo or London Bridge, get off at Maze Hill and you'll find the pottery as you leave the station on the down-line side. If you can't make the trip, visit Lisa at www.mazehill-pottery.com.